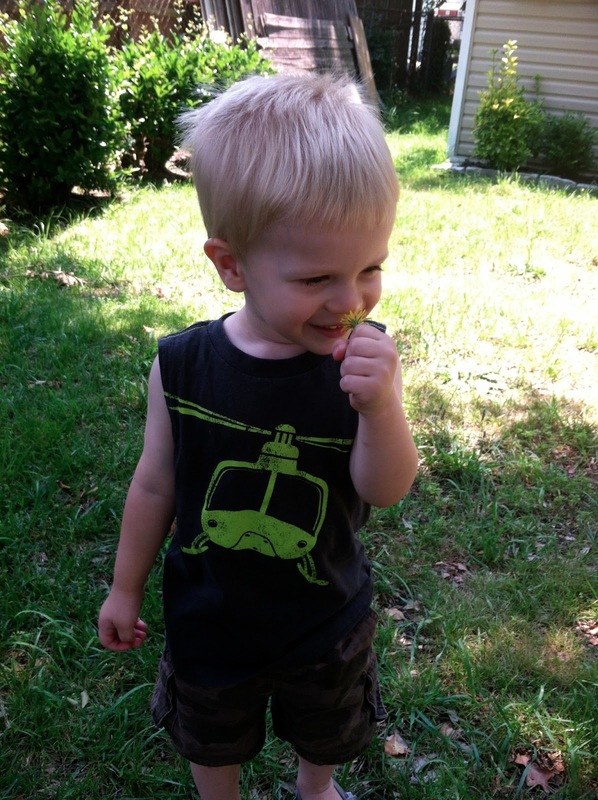 My son is in love with dandelions. He has told me that dandelions are his favorite flower because they are, "so cute". It's an absolutely precious sight to behold him running as fast as he can toward a patch of dandelions yelling, "Oooo! Dandeewions! Dandeewions!" And he picks as many as his little hands can carry and presents them proudly, "Wook mommy! I pick it fo' you!" Of course I love his enthusiasm. It is so sweet, so innocent. And every time I see him marvel over the multi-petaled, bright yellow flowers, I wonder why I can't react the same way. But I think I know why. I know dandelions are weeds. I'm sad to say that as an adult, it's a lot harder to feel the same kind of pure joy I did when I was little. I suspect that's true for all of us. By the time we hit adulthood, we just know too much about living in the reality of a sin scarred world to pretend well anymore. But maybe it doesn't have to be that way, not entirely. There are definitely worldly realities adults need to be aware of to appropriately care for themselves and their families. We also need eyes to see the broken, the hurting, the innocent victim. But I do speculate there are some areas of the world we allow into our lives that are not necessary for accomplishing any good purpose and only result in clouding our child-like faith lenses. Maybe the recipe for childlike innocence can be found in keeping the stains of this sinful world off your clothing as much as possible. The world knows that dandelions are wretched weeds that ruin a perfectly green lawn. A wide variety of sprays and pellets for killing these weeds can be found at any hardware store. But to my son, who has never been told that dandelions are weeds and doesn't have to care for the lawn, dandelions are vase-worthy beauties. Maybe the Lord wants me to embrace childlike faith in order to keep myself unspotted from the world and it's ideology that identifies Christianity as a weedy nuisance and develops it's own poisons designed to kill. Certainly there are many aspects of this life that can be filtered, modified, maybe even eliminated completely in order to maintain a childlike innocence. Notice, not ignorance, for that would be foolish, but rather what can be altered in my life so that I can appreciate even a dandelion for it's golden shade of yellow and having soft petals and being crafted so carefully by the Creator. What aspects, you ask? Well that's for the Holy Spirit to work in you. And remember, what keeps some of us unspotted from the world may look very different from the things that keep others of us unspotted (Romans 14). But maybe we should all reevaluate how necessary it is to invite things into our lives that jade us and remove the magic and mystery of life's faith journey. Every day I am more and more convinced that the Lord gives me glimpses of His kingdom through my sweet little boy. And lately as I watch him my heart has been pondering this idea of childlike faith. Not childish, but childlike - quick to love, innocent, rarely in a hurry. So friends, let's seek God's kingdom with the enthusiasm of a little child and ask for wisdom every day to reveal the areas in our lives where the world has spotted and stained. What would you add? What childlike characteristics do you think are precious in the Lord's sight? Oh, I love that! I've never thought of imaging Heaven being a part of childlike faith. Anyway, I wanted to say that it is such a good reminder that what "jades" us is really most often what we allow to enter into our atmosphere, specifically things of this world that take away from our heavenly perspective. Thank you for that. Also, I think that a childlike trust is what I find I'm often missing. I get so stressed and worried, forgetting that I can trust God implicitly, and that he will take care of us. Hmm, that's true. Like Micah and Liam just cry to us because they know we will meet their needs, God does the same. Why we aren't as quick to throw our hands up and cry for Him, I don't know. Many thanks thanks this. I truly believe that becoming more childlike is fundamental to us entering into all that God has for us, of living the life that he wants us to live, and of becoming the people that he wants us to be. It really does affect every aspect of our life & faith. But more than anything, perhaps, it speaks of littleness, of humility, of a letting go of our desire for worldly significance (fame & fortune, accolades & achievements, position & prestige & power). Of becoming like little children who have none of these things, and who recognise, from the security of their littleness, the greatness of their loving Heavenly Father. Such great thoughts. There is something comforting about those times when you feel little and run to the Father for protection. Such a wonderful picture of our relationship with our Abba! You know what amazes me about G? The child will come running to me to hold him after I put him in time out! He doesn't associate the discipline with me, doesn't hate me. He knows I'm the one that loves him and makes him feel better. B can hold a grudge for a while, but he's older. The three year old has a blinding love and complete faith that Mommy will make everything better. I wish I'd remember that about God in trials and in good times.